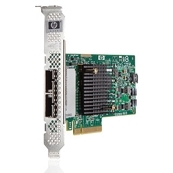 The HP H221 Host Bus Adapter (HBA) is compatible with select HP ProLiant Gen8 rack servers and tower servers, and provides customers with the flexibility and speed they have come to expect from HP . It features eight external SAS ports (two 4x external connectors) that now support HP SAS tape drives as well as 6Gb/s SAS and SATA Hard Drives with second generation performance. The H221 HBA has been optimized for connection to the new HP StorageWorks P2000 G3 SAS Modular Smart Array, and is designed to drive cost-effective and reliable scalability in today’s data centers.